NEW YORK -- The Kentucky Derby winner stumbled at the start. The Preakness winner tired in the stretch. The Belmont Stakes was up for grabs. As expected, Shackleford led from the start but when the field of 12 turned for home in the 1½-mile Belmont, he tired in the muck as long shots Stay Thirsty and Ruler On Ice passed him by. The much-hyped rubber match between Shackleford and Kentucky Derby winner Animal Kingdom never developed on a rainy day at Belmont Park. Shackleford finished fifth, while Animal Kingdom got off to a terrible start, never moved into contention and finished sixth. Jockey John Velazquez nearly fell off when Animal Kingdom collided with Monzon just after the start. He somehow managed to get his left foot back into the stirrup, but by then it was too late. Animal Kingdom had dropped more than 12 lengths off the lead, and did well to finish in the middle of the pack. An elated Valdivia, riding in his first Belmont, described the final seconds of the race while still on his horse. "I'm a couple of yards from the wire and I'm thinking, `Oh my god, oh my god, I'm going to win the Belmont,"' he said. 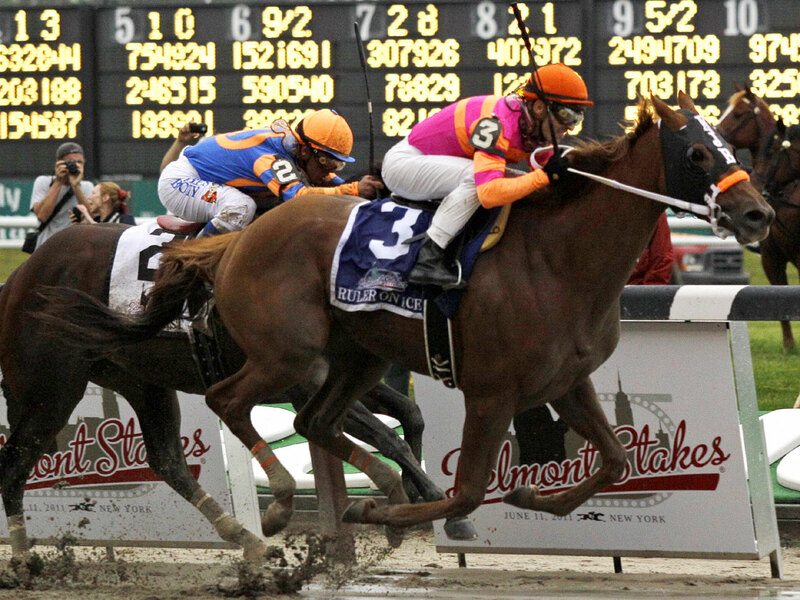 A crowd of 55,779 turned out hoping to see a stretch showdown between Animal Kingdom and Shackleford. But that vanished once the Derby winner was knocked out of contention in a bad bit of racing luck. Ruler On Ice, trained by New Jersey-based Kelly Breen, did not run in the first two legs of the Triple Crown. The 3-year-old gelding didn't have enough graded stakes earnings to qualify for the Derby, but vindicated his trainer's faith by defeating a field that included the first seven finishers in the Run for the Roses.